The prestigious KISS Humanitarian Award 2013 was presented to global philanthropist and social entrepreneur Madam Albina du Boisrouvray from Switzerland at Kalinga Institute of Social Sciences, Bhubaneswar on February 26, 2014. Rabbi Julia Neuberger, The Baroness Neuberger DBE, Founding Trustee, Walter & Liesel Schwab Charitable Trust, U.K. presented the award in the august presence of Venerable Gyétrul Jigmé Rinpoché, Founder & Director, Ripa International Centre for Buddhist Study and Practice, Switzerland, Ms. Lisa Jordan, Executive Director, Bernard van Leer Foundation, The Netherlands, Smt. Saswati Bal, President, KIIT & KISS and Dr. A. Samanta, Founder, KIIT & KISS. The award citation recognized her “concern for the millions of vulnerable children and a vision for a world having linkage between health, human rights and poverty eradication”. Madam Boisrouvray is the founder of Association François-Xavier Bagnoud (FXB International), which works with vulnerable children all over the world. The organization is named after her son, who was killed in an accident in 1986. Born in a wealthy family, she is a former journalist and film producer. However, the tragedy changed the course of her life and she established FXB International, which now leads over 100 programmes in Africa, the Americas, Asia, Europe. Her son – François-Xavier Bagnoud – was a recue pilot, who dedicated his life to providing assistance to others, and FXB International takes forward his compassionate mission, she said in her acceptance address. 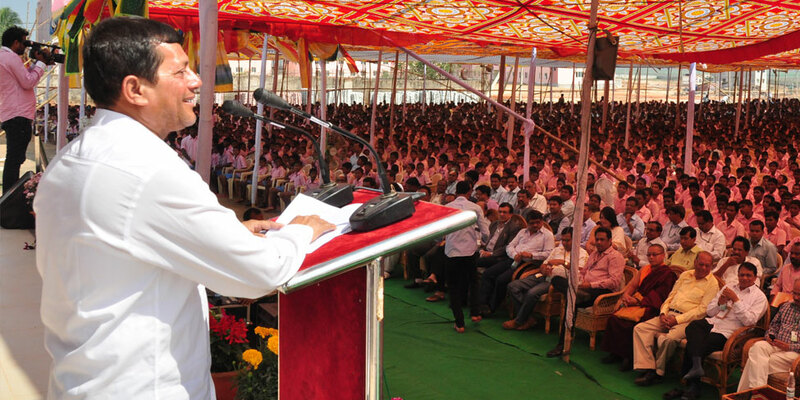 “I am humbled to see the fantastic work that is being done in Kalinga Institute of Social Sciences (KISS). It is absolutely remarkable and I congratulate the Founder of KISS Dr. Samanta for it”, she stated. Investing in children is investing in world peace, she said, adding that she wishes to share the honour with FXB team in India. Albina du Boisrouvray is a remarkable woman who was inspired by her grief, said Rabbi Neuberger, presenting the KISS Humanitarian Award – 2013. The world has hundreds of thousands of suffering children and needs many more Albinas, she added. Appreciating the work of KISS she stated, “I was delighted to see little children learning here in their own mother-tongue”. 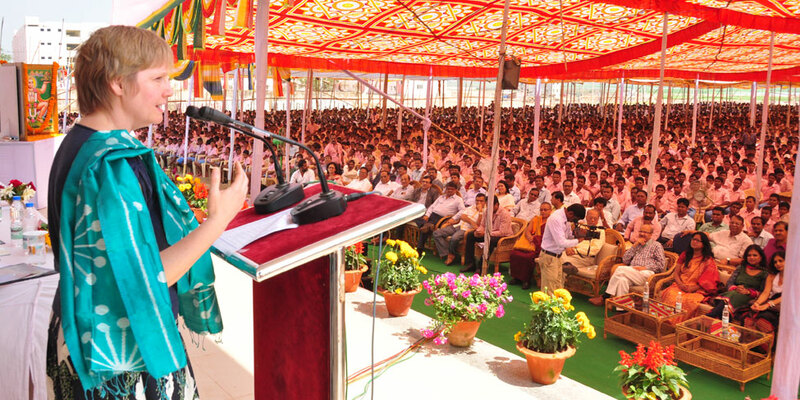 Aspirations on the face of boys and girls of the institute make the occasion very special, said Ms. Lisa Jordan. Bernard van Leer Foundation has partnered with the institute to implement multi-lingual education, she informed. 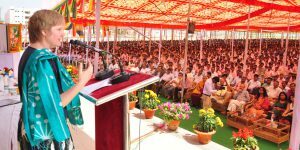 Speaking to the 20,000 cheering indigenous children present at the presentation ceremony, Venerable Gyétrul Jigmé Rinpoché said, everyone is born equal and possesses tremendous potential to become great. But this potential is unused in absence of guidance, he stated, adding that he was happy to see that KISS is providing this guidance. 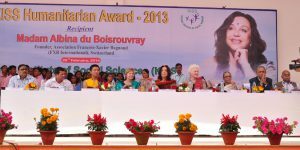 Earlier, welcoming the dignitaries to the presentation ceremony, Dr. Samanta said that it is a honour for KISS to felicitate Madam Boisrouvray, who has distinguished herself by helping millions of children in distress across the world. KISS, which is the largest free residential institute for tribal children, shares her concern, he added. Madam Albina du Boisrouvray is the sixth KISS Humanitarian Laureate. 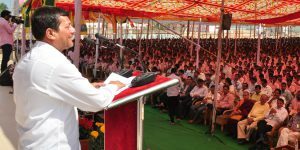 Previous recipients of this prestigious award are : His Excellency Lyonchhen Jigmi Y. Thinley, Hon’ble Prime Minister, The Royal Government of Bhutan (2012); Rt. Hon. Lord Nicholas Addison Phillips, President (Chief Justice) of the Supreme Court of the United Kingdom (2011); Rt. Hon. Sir Anerood Jugnauth, Eminent Social Worker & His Excellency the President of Mauritius (2010); Dr. Ham Kee-Sun, Eminent Educationist & Physician and Hon’ble President & Founder, Hanseo University, South Korea (2009); Ms. Edna Bomo Molewa, Noted Social Worker & Hon’ble Cabinet Minister, Social Development, South Africa National Assembly, South Africa (2008). The award ceremony was presided by Smt. 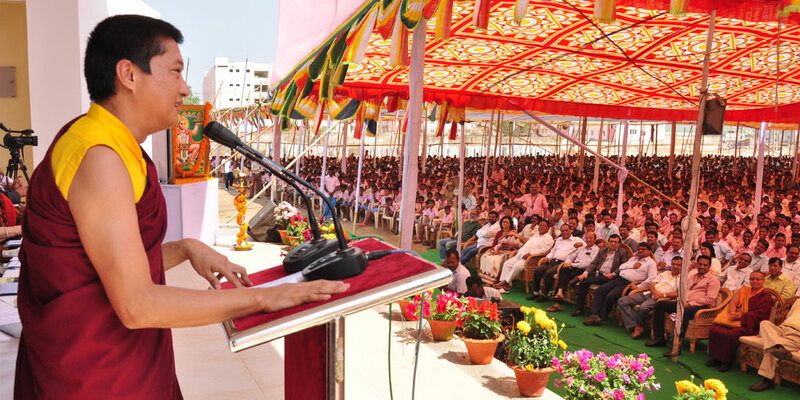 Saswati Bal, President, KIIT & KISS. Prof. N. L. Mitra, Chancellor, KIIT University, Shri R. N. Dash, Secretary, KIIT & KISS and Dr. P. K. Routray, CEO, KISS also spoke on the occasion. Very few human beings demonstrate exemplary courage and conviction to turn their pains and agonies into their strengths for loving and taking care of millions of vulnerable children. It is the true story of Albina du Boisrouvray who was an illustrious film personality, a writer and a successful business tycoon before a personal tragedy struck. She was not crestfallen when her 24 years old son met a tragic death during a helicopter mission in Mali. It was a dramatic change in her life which led her to walk away from a successful career of a film producer to champion the cause of the millions of vulnerable children left in the wake of devastating AIDS pandemic. She sold her personal belongings and assets to devote all her energy, creativity, experience and credibility as an entrepreneur to humanitarian causes through numerous projects worldwide. She founded the Association François-Xavier Bagnoud (FXB International) in memory of her son to pursue in field of development and to perpetuate the value of generosity and compassion that guided François-Xavier’s life, focusing on AIDS orphans and vulnerable children. The mission of Association François-Xavier Bagnoud (FXB International) is to fight poverty and AIDS and to support vulnerable children all over the world. Today the organization leads over 100 programmes in Africa, Americas, Asia and Europe. It was in 1992 Albina du Boisrouvray established the FXB Center for Health and Human Rights at the Harvard School of Public Health. A year later, the University of Michigan conferred upon her a “Doctor of Humane Letters Degree”. She was made a “John Harvard Fellow” by Harvard University in 1996, and in 2001, Harvard students presented her with the “Harvard Project for International Health and Development Award”. She also received a Special Recognition Award for “Responding to the HIV/AIDS Orphan Crisis” at the second conference on Global Strategies for the prevention of HIV transmission from mothers to infants in Montreal, in September 1999. For her work she received numerous awards including “Chevalier de la Légion d’Honneur”, North-South Prize from the Council of Europe, “Lifetime Achievement Award” at the 4th International Conference on AIDS in India, Thai Komol Khemthong Foundation Award of Outstanding Personality for the Year 2004, insignia of Officer in l’Ordre National du Mérite and “Officier de l’Ordre des Arts et des Lettres”. She has been a remarkable lady to think “for the forgotten issues of forgotten people in forgotten places”. As a visionary she could think – investing in children and youth is investing in world peace and security. As a tribute to the selfless work of Albina du Boisrouvray, the French TV Channel 5 devoted a full documentary within its “Empreintes”. “On behalf of the son” directed by Oliver Horn, produced by Gedeon Programs and France 5, was filmed in Thailand, Burma and from Uganda to the Swiss Alps, following Albina and meeting beneficiaries of her programs. Flowing from the source of her exceptional initiative, it gives us her conception of humanitarian development and sheds a clear light on the intrinsic meanings of her of a woman engaged and above all the love of a mother. No wonder she received honours and accolades from all over the world and she has been acknowledged as a great human being to develop inter-linkage between health, human rights and poverty reduction. 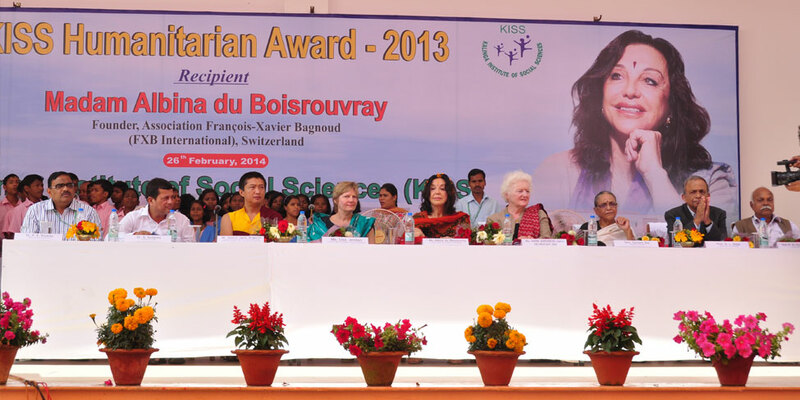 Kalinga Institute of Social Sciences (KISS) feels honoured to confer the prestigious KISS Humanitarian Award 2013 to Madam Albina du Boisrouvray. (L to R) Dr. P. K. Routray, CEO, KISS, Dr. A. Samanta, Founder, KIIT & KISS, Venerable Gyetrul Jigme Rinpoche, Founder & Director, Ripa Intl Centre for Buddhist Study & Practice, Switzerland, Ms. Lisa Jordan, Executive Director, Bernard Van Leer Foundation, The Netherlands, Madam Albina Du Boisrouvray, Founder, Association François-Xavier Bagnoud (FXB International), Switzerland, Ms. Rabbi Julia Neuberger, The Baroness Neuberger DBE, Founding Trustee, Walter & Liesel Schwab Charitable Trust, U.K., Smt. Saswati Bal, President, KIIT & KISS, Prof. N. L. Mitra, Chancellor, KIIT & Mr. R. N. Dash, Secretary, KIIT & KISS at the KISS Humanitarian Awards 2013 Ceremony. 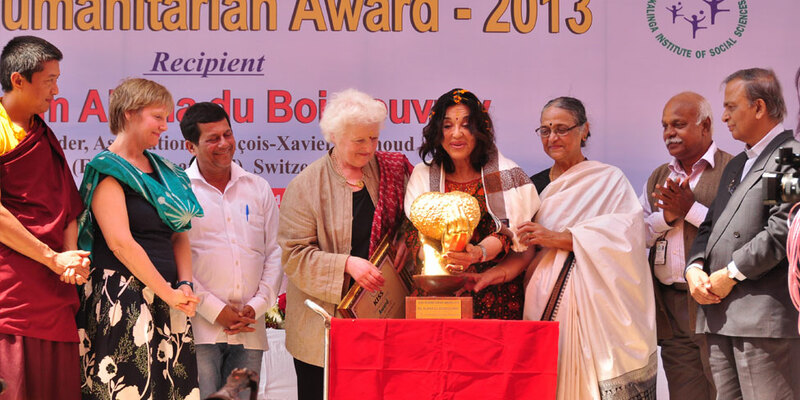 Madam Albina Du Boisrouvray, Founder, Association François-Xavier Bagnoud (FXB International), Switzerland receiving the KISS Humanitarian Award from Ms. 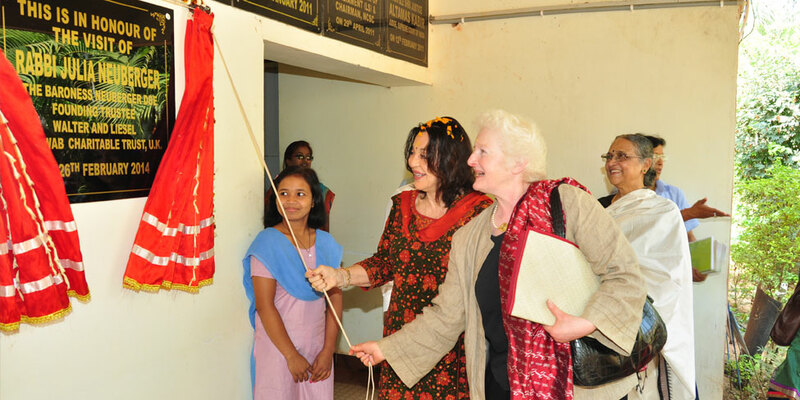 Rabbi Julia Neuberger, The Baroness Neuberger DBE, Founding Trustee, Walter & Liesel Schwab Charitable Trust, U.K in the presence of Ms. Lisa Jordan, Executive Director, Bernard Van Leer Foundation, The Netherlands & Dr. A. Samanta, Founder, KIIT & KISS. 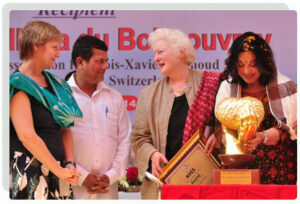 Madam Albina Du Boisrouvray, Founder, Association François-Xavier Bagnoud (FXB International), Switzerland & Ms. Rabbi Julia Neuberger, The Baroness Neuberger DBE, Founding Trustee, Walter & Liesel Schwab Charitable Trust, U.K unveiling a stone plaque in KISS. 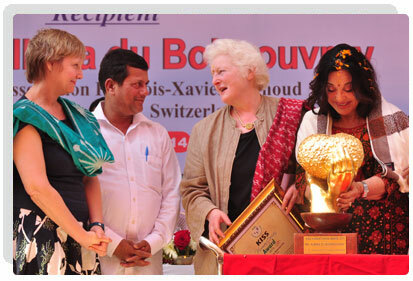 Madam Albina Du Boisrouvray, Founder, Association François-Xavier Bagnoud (FXB International), Switzerland receiving the KISS Humanitarian Award 2013 from Ms. Rabbi Julia Neuberger, The Baroness Neuberger DBE, Founding Trustee, Walter & Liesel Schwab Charitable Trust, U.K., in the presence of Venerable Gyetrul Jigme Rinpoche, Founder & Director, Ripa Intl Centre for Buddhist Study & Practice, Switzerland, Ms. Lisa Jordan, Executive Director, Bernard Van Leer Foundation, The Netherlands, Dr. A. Samanta, Founder, KIIT & KISS, Smt Saswati Bal, President, KIIT & KISS, Prof. N. L. Mitra, Chancellor, KIIT & Mr. R. N. Dash, Secretary, KIIT & KISS.